Most publications are downloadable (e-prints). Originals can be found through the doi link. 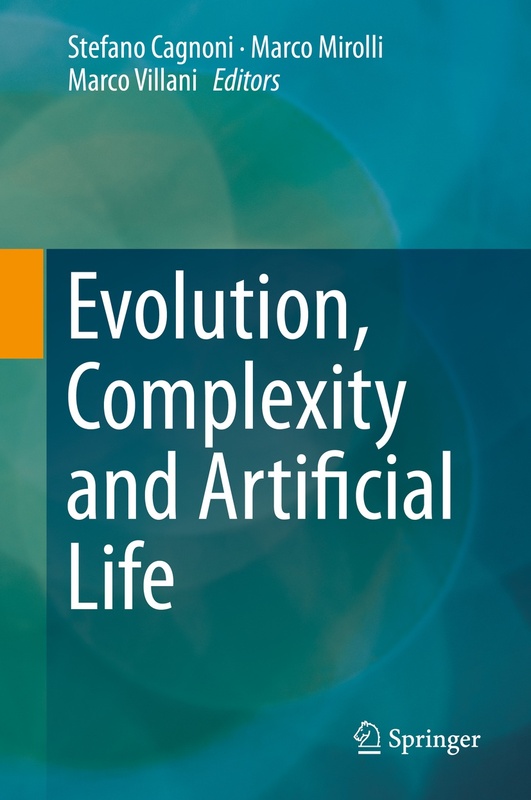 Cagnoni Stefano, Mirolli Marco, Villani Marco (2014): Evolution, Complexity and Artificial Life, Berlin: Springer. Baldassarre Gianluca, Mirolli Marco (2013): Intrinsically Motivated Learning in Natural and Artificial Systems, Berlin: Springer. 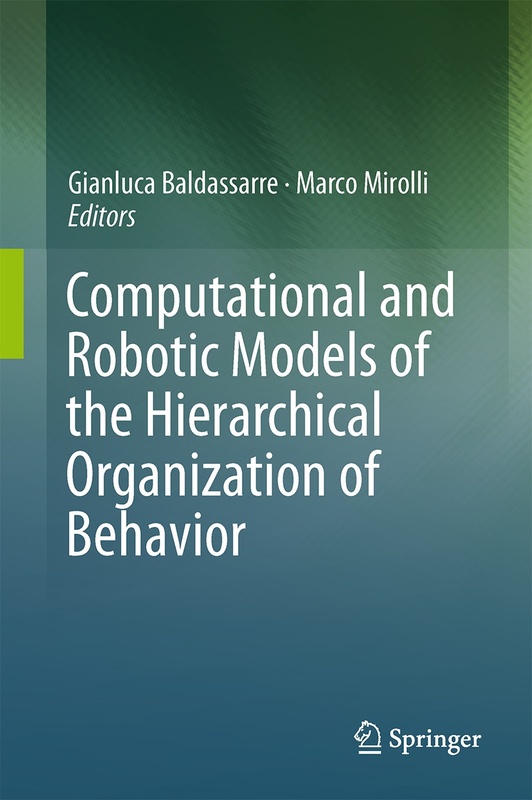 Baldassarre Gianluca, Mirolli Marco (2013): Computational and Robotic Models of the Hierarchical Organization of Behavior, Berlin: Springer. 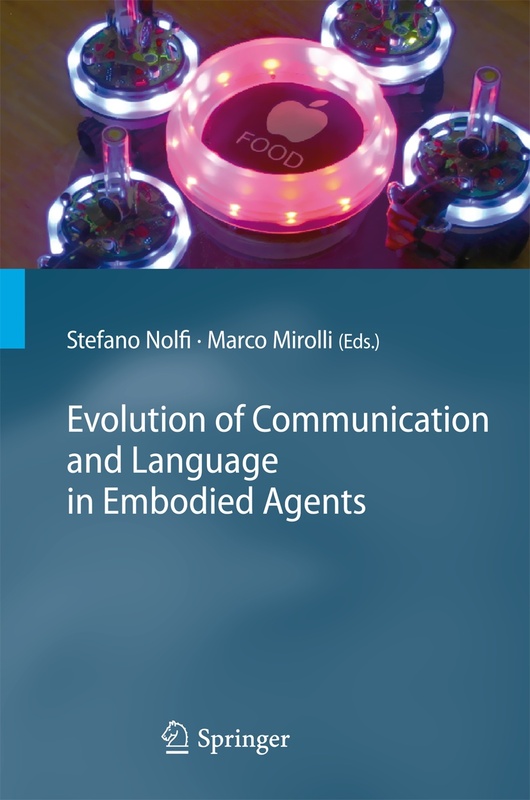 Nolfi Stefano, Mirolli Marco (2010): Evolution of Communication and Language in Embodied Agents, Berlin: Springer. Mirolli Marco (2012): Representations in Dynamical Embodied Agents: Re-Analyzing a Minimally Cognitive Model Agent, Cognitive Science, 36: 870-895. Taffoni Fabrizio, Vespignani Massimo, Formica Domenico, Cavallo Giuseppe, Polizzi di Sorrentino Eugenia, Sabbatini Gloria, Truppa Valentina, Mirolli Marco, Baldassarre Gianluca, Visalberghi Elisabetta, Keller Flavio, Guglielmelli Eugenio (2012): A mechatronic platform for behavioral analysis on nonhuman primates, Journal of Integrative Neuroscience, 11(1): 87-101. Mirolli Marco, Parisi Domenico (2011): La societa' nella mente (attraverso il linguaggio), Sistemi Intelligenti, 2: 309-317 (Italian). Mirolli Marco, Parisi Domenico (2011): Towards a Vygotskyan Cognitive Robotics: The Role of Language as a Cognitive Tool, New Ideas in Psychology, 29: 298-311. Mirolli Marco, Tomassino Ferrauto, Stefano Nolfi (2010): Categorisation through Evidence Accumulation in an Active Vision System, Connection Science, 22(4): 331-354. Mirolli Marco, Mannella Francesco, Baldassarre Gianluca (2010): The Roles of The Amygdala in the Affective Regulation of Body, Brain, and Behaviour, Connection Science, 22(3): 215-245. 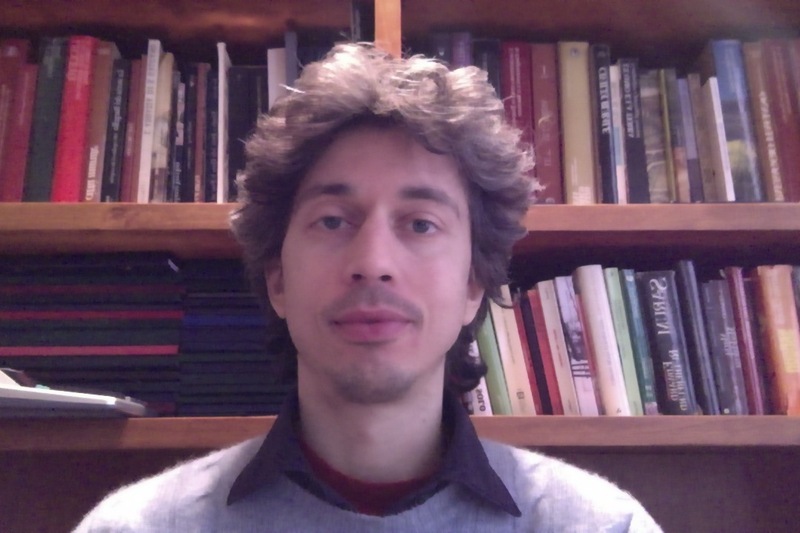 Baldassarre Gianluca, Mirolli Marco (2010): What are the Key Open Challenges for Understanding Autonomous Cumulative Learning of Skills?, Autonomous Mental Development Newsletter, 7(2): 2-9 (target column with commentaries and response). Mirolli Marco, Parisi Domenico (2009): Language as a Cognitive Tool, Minds and Machines, 19(4): 517-528. Mirolli Marco, Parisi Domenico (2008): How producer biases can favor the evolution of communication: An analysis of evolutionary dynamics, Adaptive Behavior, 16(1): 27-52. Mirolli Marco (2006) Vita artificiale e linguaggio, Sistemi Intelligenti, 1: 133-142 (Italian). Baldassarre Gianluca, Marocco Davide, Mirolli Marco (2006): La via italiana alla vita artificiale, Sistemi Intelligenti, 1: 3-6 (Italian). Mirolli Marco, Parisi Domenico (2005): How can we explain the emergence of a language that benefits the hearer but not the speaker? Connection Science, 17(3-4): 307-324. Mirolli Marco (2002): A naturalistic perspective on intentionality. Interview with Daniel Dennett, Mind & Society, 6 (3): 1-12. Santucci Vieri G., Baldassarre Gianluca, Mirolli Marco (2014): Autonomous selection of the “what” and the “how” of learning: an intrinsically motivated system tested with a two armed robot: Proceedings of the IEEE International Conference on Development and Learning and Epigenetic Robotics (ICDL-EpiRob2014): 1-6. Gigliotta Onofrio, Mirolli Marco (2014): Evolution of communication-based collaborative behavior in homogeneous robots. In Sayama H., Rieffel J., Risi S., Doursat R., Lipson H. (Eds.) Artificial Life 14. Proceedings of the Fourteenth International Conference on the Synthesis and Simulation of Living Systems. Cambridge MA, MIT Press: 673-680. Mirolli Marco, Baldassarre Gianluca (2013): Functions and Mechanisms of Intrinsic Motivations: The Knowledge vs. Competence Distinction. In Baldassarre G. and Mirolli M. (Eds.) Intrinsically Motivated Learning in Natural and Artificial Systems. Berlin, Springer Verlag: 49-72. Baldassarre Gianluca, Mirolli Marco (2013): Deciding Which Skill to Learn When: Temporal-Difference Competence-Based Intrinsic Motivation (TD-CB-IM). In Baldassarre G. and Mirolli M. (Eds.) Intrinsically Motivated Learning in Natural and Artificial Systems. Berlin, Springer Verlag: 257-278. Fabrizio Taffoni, Domenico Formica, Giuseppina Schiavone, Maria Scorcia, Alessandra Tomassetti, Eugenia Polizzi di Sorrentino, Gloria Sabbatini, Valentina Truppa, Francesco Mannella, Vincenzo Fiore, Marco Mirolli, Gianluca Baldassarre, Elisabetta Visalberghi, Flavio Keller, and Eugenio Guglielmelli (2013): The “Mechatronic Board”: A Tool to Study Intrinsic Motivations in Humans, Monkeys, and Humanoid Robots. In Baldassarre G. and Mirolli M. (Eds.) Intrinsically Motivated Learning in Natural and Artificial Systems. Berlin, Springer Verlag: 411-432. Baldassarre Gianluca, Mirolli Marco (2013): Intrinsically Motivated Learning Systems: An Overview. In Baldassarre G. and Mirolli M. (Eds.) 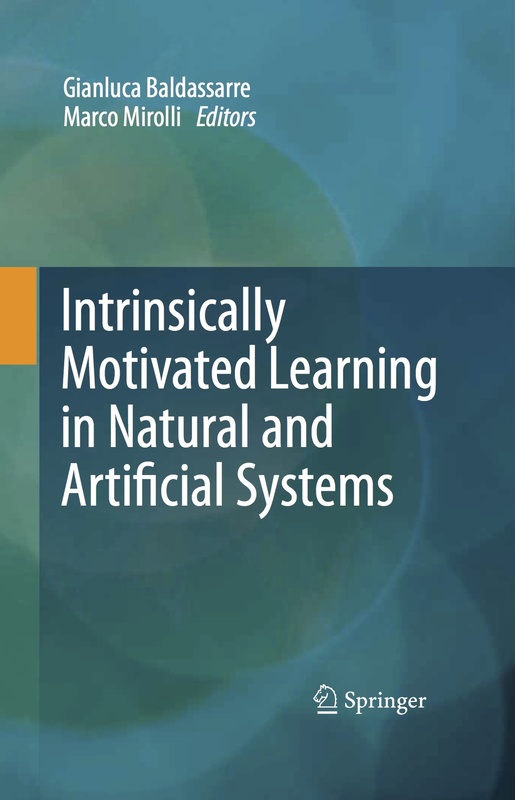 Intrinsically Motivated Learning in Natural and Artificial Systems. Berlin, Springer Verlag: 1-14. Baldassarre Gianluca, Mirolli Marco (2013): Computational and Robotic Models of the Hierarchical Organization of Behavior: An Overview. In Baldassarre G. and Mirolli M. (Eds.) Computational and Robotic Models of the Hierarchical Organization of Behavior. Berlin, Springer Verlag: 1-10. Parisi, Domenico, Mirolli Marco (2007): Steps Towards Artificial Consciousness: A Robot's Knowledge of Its Own Body, In AAAI Fall Symposium on "AI and Consciousness: Theoretical Foundations and Current Approaches"